Bristol’s Mayor Marvin Rees recognises the importance of digital connectivity and has set a target in the Council’s Corporate Plan for Bristol to make progress towards being the UK’s best digitally connected city. But what are we doing to help make this progress? The Government is committed to accelerating the pace of the roll out of Full Fibre networks and 5G and have made £1.1 billion available through the Industrial Strategy. As part of this, they have launched the Local Full Fibre Networks initiative, which includes a gigabit voucher scheme and challenge funding competitions for local bodies to get grant funding for extending full fibre networks in their areas. Bristol was selected, alongside BANES, to pilot a gigabit voucher scheme which has now been rolled out nationwide. 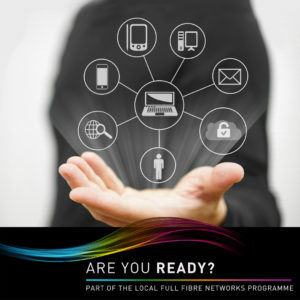 Businesses could get up to £3,000 towards the cost of installing a gigabit-ready connection, and residents can join with local businesses in a group scheme and get £500 towards the cost. Here’s how the scheme works and contact one of registered suppliers on the scheme to see if you can get a voucher. Bristol small busineses and organisations are urged to take advantage of the gigabit voucher scheme as soon as possible, as funding is available for a limited period only! Bristol bid for the first Challenge Fund competition to win funding in order to extend the council-owned BNET fibre and duct network. The bid was designed to help connect public buildings like schools, libraries and community hubs get a gigabit connection. Under intense competition, this bid was not successful, however, we will be bidding again with the West of England Combined Authority (WECA) and our neighbouring authorities in the West of England to mount a persuasive case for the Government to invest in better broadband for the West of England. We will be visiting DCMS later in the summer to pitch our ideas for how we could improve our digital infrastructure and further extend full fibre networks to the benefit of public services, residents and businesses. Bristol is also preparing for the upcoming transition to 5G in partnership with WECA and our neighbouring authorities. The city already has a 5G test bed in Millennium Square installed by the University of Bristol’s Smart Internet Lab and used in the ground breaking Layered Realities Weekend – which gave people the chance to play with applications and games using 5G. WECA recently won £5 million in its Smart Tourism bid to explore how 5G could use augmented / virtal reality applications to enhance the visitor experience at key visitor destinations like the Roman Baths. As part of this project, Bristol City Council will also be looking at how 5G and new innovations can keep visitors safe. In June 2018, WECA led on a bid to become the UK’s Urban Connected Community – a competition which will designate an urban area as the UK’s foremost demonstrator of 5G technology and what you can do with it, particularly around the delivery of public services. The West of England bid focuses on the use of 5G around the themes of mobility, health & social care and inclusion. Competition will be fierce for this prize and we should know the outcome at the beginning of July 2018. It’s important that Bristol has the right planning policies to ensure that new developments are built ready for full fibre. We are updating our Local Plan and its implementation, asking developers to evidence how residential and business developments will have availability of fibre broadband from day 1 occupancy. We will also be fully engaging with the Government’s fibre barrier-busting initiative which will shortly recommend how areas can better work with telecoms companies to help the national push for full fibre. Bristol is also looking at ways its assets, like street furniture, can be easily accessed by telecoms companies in new streamlined processes. City Fibre has also designated Bristol as a Gigabit City and is actively extending the major fibre network they already have in the city, helped by the Gigabit Voucher Scheme. This very welcome investment will improve choice and competition in the city delivering better deals for consumers. Connectivity is key to the region’s future prosperity and we are responding to this challenge.